Differing opinions on the HP Lexicon: Do we have Soul? As a librarian rather than an IP lawyer I admit to getting my back up a bit at the outset of this article, based on the stated hierarchy that places creator control on a higher plane than public use and re-use. Much as some publishers might claim otherwise, Fair Dealing/Fair Use is not an inferior or less legitimate part of copyright law when compared with Creator Rights. These two elements of copyright law coexist in order to attempt a balance that is in the public interest, rewarding creative work without unduly locking it up and preventing derivative works. What portion of the original work is used? What is the impact on the market for/value of the original work? According to Hilden, the first three of these factors cut in favour of Rowling (the third perhaps less strongly than the first two). The fourth factor, she also finds falling in favour of Rowling’s argument, although most weakly of all the factors. This may all be correct from a strictly legal standpoint. It is true that there is little new “creative” (as in fiction, or creative writing) content added to a reference work. It is true that a reference guide will generally use much of the source content. The market value question…well, I don’t know if that one can even be argued, truly, but if all other points are found in favour of Rowling the fourth one could just limit any damages owed. Interesting choice of words, as I am sure many colleagues in the information professions will agree. Does it require little soul to create reference material? Are bibliographers and lexicographers inherently slight-of-soul? This year-old profile of Steve Vander Ark in a local newspaper (the Grand Rapids Press) paints him as, frankly, very soulful. Vander Ark is apparently a “prayerful” Christian who doubles as a staunch defender of the HP series against allegations of evil and witchcraft at the religious school in which he is a library media specialist. This article – written well before the Lexicon lawsuit was filed – paints Vander Ark as a thrilled reader, obsessively creating a HP reference to promote the books and draw others in to his fannish enthusiasm. Not only do other fans fawn over Vander Ark’s resources –Rowling and Scholastic also gush about their utility. The GR Press article contradicts the idea of a lexicographer as possessing “little soul,” either in religious, moral or creative sense. What Vander Ark has done is not create fiction or new characters, but cultivate a community and stand up for values of intellectual freedom. I am no great HP fan (there, I’ve said it) but I am under the distinct impression that Vander Ark is among the fandom leaders who have greatly contributed to the success of the HP empire. Small publishing is not typically a lucrative business. I would guess that Vander Ark will be lucky if he makes the equivalent of pennies of book profit for every hour’s work he has put into the HP Lexicon – especially if Rowling does indeed compile her own more authoritative lexicon. My understanding is that Vander Ark did most of his Lexicon work online without even a book contract in sight. I have to say that it really does sound like Vander Ark undertook this project as a labour of love. Al, but does love equal soul? What is Creativity? What is Soul? And then there’s the question of whether, “prayerful” qualities of some individuals aside, bibliographic work, scholarly commentary, and reference work are creative; whether they have soul. Oof. Yes, we know librarian work is frequently both behind the scenes and taken for granted. But you really feel it when someone says the work you do, organizing the world’s information and making it accessible to the masses, is soul-less. My introduction to the bibliographic work of librarians was my supervisor in the Oberlin Conservatory Library pouring years of her time into An Index to African-American Spirituals for the Solo Voice – a bibliography that has perhaps more soul than most. I suppose it could be argued that providing an index to solo spirituals is non-creative, non-transformative, and an example of a white academic re-using creative content from the African American community. However, in a world dominated by lieder and arias, providing soloists, vocal instructors and musicologists – particularly those of African descent – with vastly improved access to music of an historically oppressed group may be a truly progressive, even creative solution to the whitewashing of the art music world. Does HP have this elusive ‘Soul’ anyway? It’s been documented that Rowling’s HP books are of questionable originality – for example, “Muggles” were previously written about in 1984 by author Nancy Stouffer, creator of characters Larry Potter and Lilly Potter. “already had made personal use of Vander Ark’s work and found it valuable. Even if it has shortcomings, she found it useful. Thoughts? Does your library or information type work have soul? When I moved to Canada, I was shocked to learn that parody is not a specially protected form of speech here. It is in the US, and I like to think I made pretty good use of that principle over the years. You may already be aware of some of the freedom of expression lawsuits media company CanWest has been involved with. 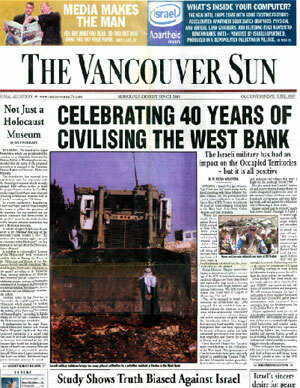 Here’s another for the list: CanWest is suing Vancouver activist Mordecai Briemberg for a parody of the Vancouver Sun newspaper – a parody Briemberg maintains he had no hand in creating. parody for the actual newspaper being spoofed. The parody focuses on the alleged pro-Israel bias of the Sun and the Asper family (owners of CanWest). While the suit documentation from CanWest discusses at length Briemberg’s “anti-Israeli and pro-Palestinian media activities,” the part of the suit that has actual potential legal grounds is trademark infringement. You see, the parody paper creators used the actual title “The Vancouver Sun” and mocked it up to look just like the real newspaper header. However, I daresay that CanWest will be hard pressed to show any actual damages done by reprinting the trademark. What is most outrageous about this lawsuit is that it is a prime example of a “SLAPP” – a strategic lawsuit against public participation. Such suits are aimed at, well, shutting people up, to put it bluntly. Briemberg maintains that he had no hand in the creation of the parody paper. Briemberg admits to picking up some copies at a public meeting at the public library and handing them out. Briemberg is a well-known activist who has been critical of the State of Israel and supportive of the Palestinian people. The best I can figure is that CanWest was pissed off about the parody and shot in the dark at a likely suspect who also irritated them, figuring that even if it wasn’t Briemberg, at least maybe the SLAPP in the face would shut him up. In solidarity with Briemberg and/or out of anger toward this kind of lawsuit and intimidation tactic, several individuals and outlets have been posting copies of the parody paper both in print and online. Great idea! Feel free to print it out and put it on your office door, post it in your neighbourhood or your own blog! Better copies of front page and a PDF of the full text (no images) are also available elsewhere. For ideas of what else you can do/more background on Briemberg and this case, see the recent post from We Read Banned Books and the Seriously Free Speech Website. Or look at the BC Library Association resolution on the issue from the recent AGM. Seriously Free Speech is coordinating many efforts in support of Briemberg, from a Facebook group (go there for details; Facebook is too evil for me) to petition to briefing notes you can use. The Canadian policy wonk blogosphere has been abuzz with the breaking of the news last week that the Tories (capital-c Conservatives for the non-Canuck readers out there) sent out a notice to civil servants advising them reporting access to information requests to the centralised database, CAIRS, was no longer a requirement. Let’s talk about what’s going on here. Originally created in 1989, it was used as an internal tool to keep track of requests and co-ordinate the government’s response between agencies to potentially sensitive information released. Public Works, which has operated the database, spent $166,000 improving it in 2001. As recently as 2003 federal officials had been working on a publicly accessible, online version. In an attempt to get a better idea of the relationship between CAIRS and public access to access to information requests (that looks very strange written out…I suppose that’s a testament to how bizarre keeping access to information requests secret really is), I poked around the website of the Office of the Information Commissioner of Canada. (T)he right of access has become more and more entrenched in the operations of government. There is more transparency and, hence, accountability in government. No, it is not always easy for Canadians to stomach what they see through the windows into government opened by the access law, nor for public officials to govern in a fishbowl. Yet excessive secrecy would be even harder to digest; our democracy is all the more vibrant for the legally enforceable right we Canadians have to go behind the “stories” governments choose to tell us, to obtain source documents, and to explore the stories which all governments store in dark corners. …but not one mention of CAIRS in the whole report, despite the fact that “extensive” consultations have supposedly been going on. I guess they weren’t so extensive as to already be on the radar a year ago? Why was the requirement to update CAIRS done away with? A Treasury Board official confirmed to the Canadian Press on Friday that the system is being killed because “extensive” consultations showed it wasn’t valued by government departments. Instead, “valuable resources currently being used to maintain CAIRS would be better used in the collection and analysis of improved statistical reporting,” said Robert Makichuk. So, either the cost of administering the database has somehow skyrocketed since 2002, despite no notable upgrades since Y2K nor going ahead with the plan to make CAIRS publicly searchable on the Internet, or $1 per Canadian per year is suddenly too much money to spend on access to information? probably hoping to avoid brouhaha by doing so quietly and with no advance notice. All part of a day’s work for an administration that is hard at work opening up access to information “more than ever before” and rewriting history. And hopefully this will backfire on them due to the growing political outcry, causing CAIRS to be reinstated. But one thing I want to know is why was an independent journalist (and prior to that an independent academic) maintaining the only public access to this database to begin with, when in 2002-2003-2004 it was clearly being reasoned by the Office of the Information Commissioner of Canada that online access was easy, inexpensive, and ethically compelling? While the lack of mention of CAIRS in recent annual reports casts doubt on the actual extensiveness of the consultations (the consultations, regardless of extent within the government, did not seek public input) that led to the CAIRS shutdown, the apparent lack of movement toward greater public access over several years, in the face of rhetoric indicating that would be the correct direction, makes me wonder. Was this just the opportune moment to shut down a service that some never liked to begin with? What role did the Tory administration really play in this shutdown – could their general killing of government services to the public merely have provided an opportunity, or was there really a more nefarious anti-transparency agenda? Finally, I have to admit I laughed a bit at the notion that the accountability database should be shut down because those being held accountable didn’t value the service. Didn’t you laugh at that? That’s like saying that parking tickets should be abolished because people who park illegally don’t value paying the fines.